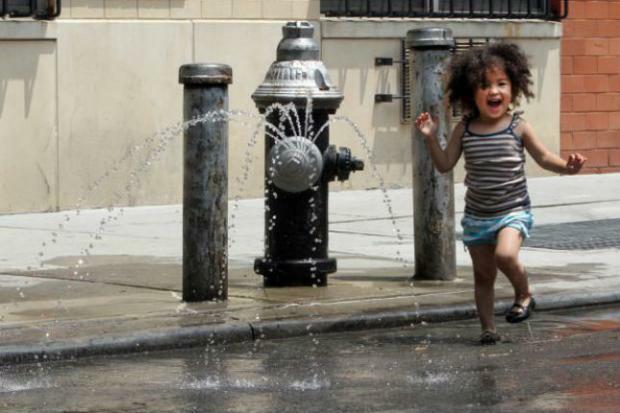 A 2-year-old girl plays near a fire hydrant in Harlem. Temperatures are expected to feel as high as 110 degrees through Sunday night during what weather officials say is a heat emergency. NEW YORK CITY — Temperatures are expected to feel as high as 110 degrees through Sunday night — in a "heat emergency" the mayor warned is worse than past heat waves. While the actual temperature will range from 92 to 95 degrees for the next few days, the heat index will make it feel more like 105 to 110 degrees before the heat and humidity give way to thunderstorms. "People should expect very tough conditions all the way into Sunday night," Mayor Bill de Blasio warned New Yorkers during a press conference at the city's emergency command center. "This one is different. This one is tougher. This one is worse." The heat emergency is the city's first in three years, de Blasio added as he urged New Yorkers to take precautions to keep themselves safe. The city's large and intermediate sized pools will remain open an extra hour through 8 p.m. and the city's 500 cooling centers will also remain open. New Yorkers can find the closest cooling center with the OEM's map or by calling 311. Fire Commissioner Daniel Nigro said EMS calls are up 10 percent and there were 59 heat related calls Thursday but no heat-related deaths. De Blasio also urged people to keep their air conditioners set at 78 degrees to help alleviate pressure on the power grid. "This is a heat emergency. Use air conditioning but set it to 78 degrees," de Blasio said. "We've got the biggest population the city has ever had in its history, huge demands on the power grid. The last thing any of us wants to go through is a blackout."